Cherry Hill Primary kindergarten classes recently created a service learning project that benefited the environment as well as the Washington Court House community. 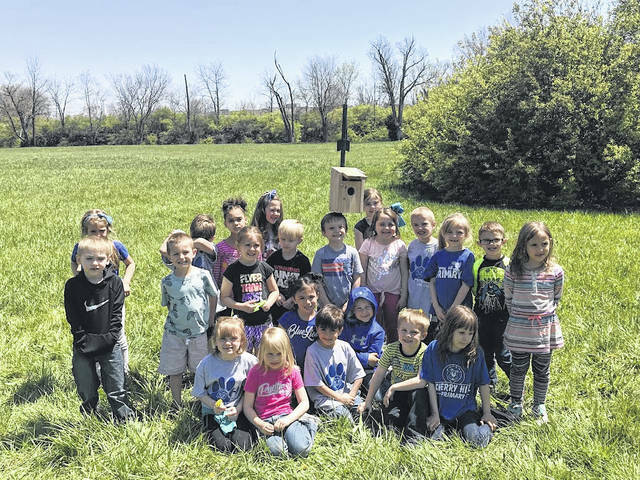 Students in Amber Blair’s, Lee Ann Picklesimers’, Carrie Davis’ and Stacey Schneder’s kindergarten classes made blue bird nesting boxes for the school grounds. 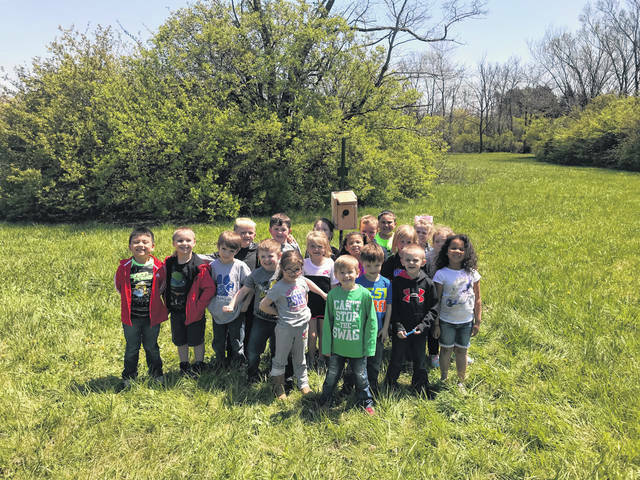 The students were inspired to create the blue bird boxes after they noticed that several birds had made nests on playground equipment at Cherry Hill Primary. Students called the Fayette Soil and Water Conservation District to find out how they could help. 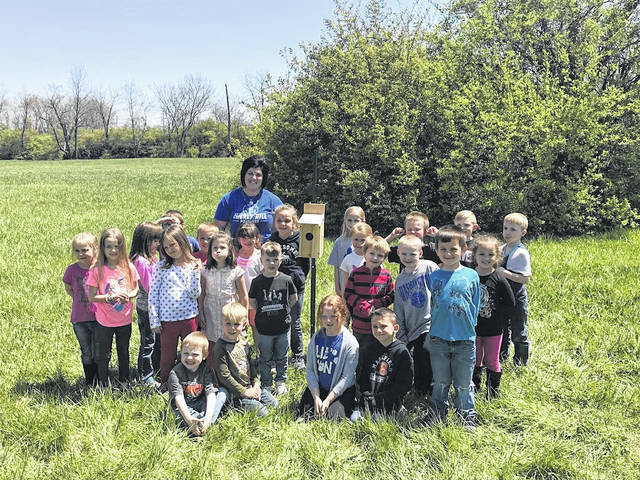 Brigitte Hisey, a natural resource specialist with Fayette Soil and Water Conservation, came to Cherry Hill Primary school to talk to the kindergarten classes about birds. She said that blue birds need homes. In the past, blue birds used wooden fence posts to construct their homes on, but now not as many people use wooden fence post in their yards or fields. Blue birds need a safe place to build nests so they can have their babies. Hisey gave the students directions about how to build bluebird nesting boxes. Kindergarten students worked together in their classrooms with Hisey and their teachers to construct the boxes. 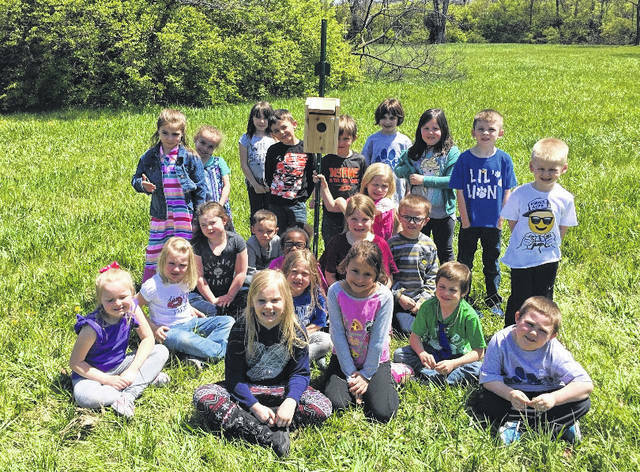 Later, the students and teachers installed the blue bird boxes in various locations around the elementary school. In their classrooms, students read several books about birds. They learned about the different parts of a bird as well as unique characteristics about different birds. “We did an activity called the Bird Olympics where we investigated bird beaks, the rate at which they flap wings, wing span and the distance at which they smell,” Blair said. Through several interactive experiments, kindergartners learned about how birds smell and eat. Students learned about the wingspan of birds as well as how fast they can flap their wings. Kindergarten students also learned about the different sounds that birds make. The students were able to listen and distinguish between the varied sounds each bird species makes.